Hello Tenfold was founded in 2009 and since then we've done more wedding suites than we care to count. Not all of them are still in the shop, but some of them are right here for your browsing pleasure. If you'd like to place an order for a suite you see on this page, we hope you'll get in touch. A bright and fresh invitation suite in peach, blue, and plaid. Ideal for summery picnic weddings. Our Dot suite is crisp, clean, and minimal, with a touch of fun in the form of a hand-drawn polka dots pattern in black, white, and neutral tones. Our watercolor design is airy, romantic, and modern. We tied the invitation suite with rustic twine and slipped in a dried flower for each guest. 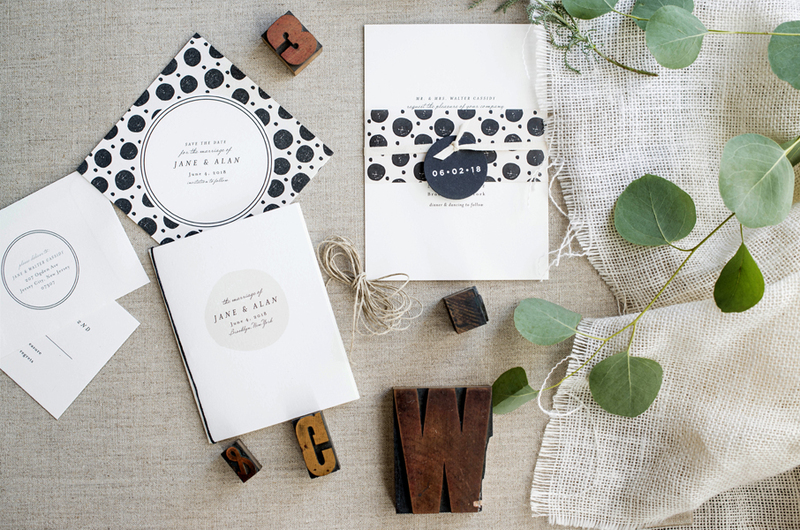 Dot & Flourish is a popular, versatile invitation suite. This set features fun fonts combined with seafoam stripes, a scalloped polka dot pattern, and white ink screen printed on navy and kraft papers. 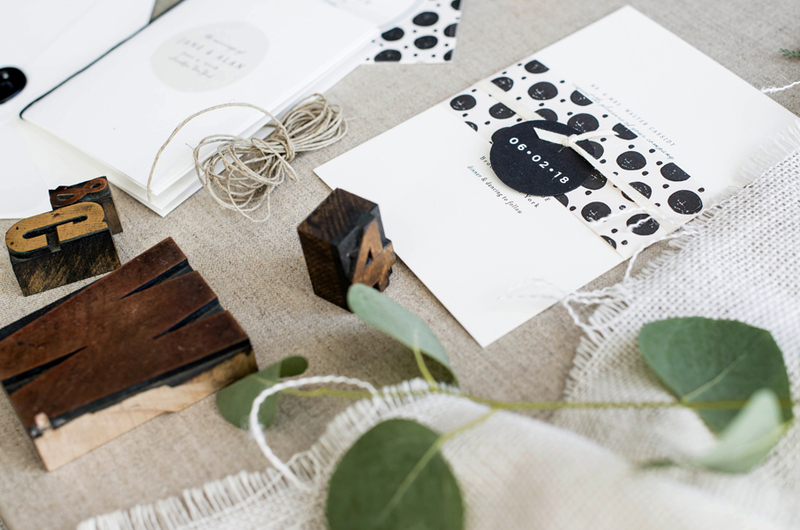 Twine, a striped invitation band, and a monogram hang tag held the various cards together. Our romantic Peony invitation suite, shown here in crisp navy and blush pink. This custom invitation suite for Akron sweethearts Mary Beth and Dan is one of our favorites. We worked with chartreuse, navy, kraft, and newsprint papers for a modern, rustic vibe. Map hang tags showed some local pride, while an accordion-folded save the date shared their dating story, and we created a folded mad libs reply card for a touch of nostalgia. Custom bottle labels were designed for a home brew. We loved designing this modern and bold invitation suite for Meredith and Michael, featuring their wedding flower (orchids) and black and white stripes inspired by the umbrellas at their pool-side reception in Florida. Casual, rustic, and fun! Our invitation suite for Caroline and Joe was printed in chocolate brown and featured custom illustrations on the reply card and a hand drawn border for the invitation. Bold patterns for the envelope liner and band pulled the suite together. 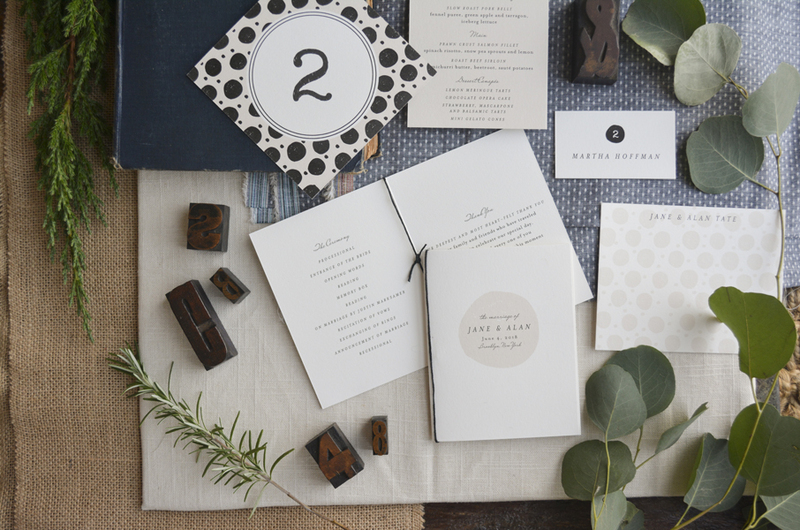 Our Miles invitation suite was inspired by mid-century textiles and colors.